Glenn Beck is well known for arguing that we have misunderstood that founding fathers & their desire to keep church & state separate. Holding his rally on 8/28, he gathered 150.000 people to hear him talk about bringing out country "back to God". What do you think it would do to our country to "get back to God"? 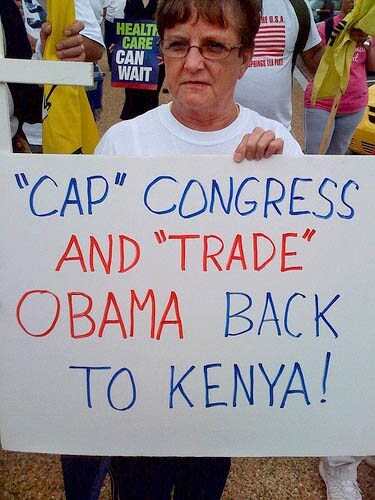 The Tea Party has been called racist Chrisotcrats. In their recent convention, most conference sessions began with prayers. What do you think of the Tea Party? Do you know very little about them? Do you know a lot? Please share your thoughts here. Personally, I find them absolutely horrifying. Fear started this movement. Fear of a dark skinned man with a middle eastern name. They fear everything about Obama. From the color of his skin to his fathers religion. The TP will deny, deny, deny this but to anyone paying attention to them and their actions, its very obvious. I've met TPers and they openly use the N word around me as if I am one of them. While the younger members are different, any TPer above 40 is flat out xenophobic or racist. They hate Mexicans, Muslims, homosexuals, blacks and basically anything that is not white washed & Christian. Yes, fear of the Jews, too. And a very astute article. America managed to have some resolve in the face of a decades-long threat of nuclear annihilation, but now that that's faded, we're peeing ourselves over nonsense. I blame the religious mindset, capable of believing anything without evidence. Come on, are you saying the Tea Party wouldn't exist if Obama were white or if another democratic candidate would have won instead of him? The Tea Party, IMO, is a right wing creation that exists to fight the democratic agenda, regardless of the race or religion of the president. These are pretty mild but Im not going to go out of my way proving anything. As I stated earlier, this is my opinion based off observation and personal experiences. In my experience nothing drives humans to act irrationally more than emotion. The whole TP was forged by hatred and fear. Tell me, would a rational person believe the Birther theory? Would a rational person believe that a newspaper birth announcement could be planted 49 years ago just to throw them off? Go ask any TPer if they know Obama's middle name... Ask if they happen to know Bush's middle name... Hell, ask them if they know where GWB's father is from... Id be willing to bet 10-1 they know 100 Xs more about Obama then all the US presidents combined. You know why? Well if Obama had a nice Christian name and white skin no one would give 2 shits about where he came from or his family heritage. Wow, are these actual pictures of Tea Partiers, Guy? That is pretty wild. The children holding signs is very disturbing to me. Being a parent, I think it is such a travesty to impose our own ideals on our children, especially when they are not old enough yet to form their own opinions. You just make them stand there and hold a sign up, and they'll do it because you told them to. I saw this happening here in California just before Prop 8 Passed. Tons of families were outside with Yes on 8 signs. Tons of children were holding up those signs. Totally cruel. The TPers of course, deny it....Another BS conspiracy... A lot of them claim that all racist signs, members, basically anyone who makes them appear racist are infiltrators & inciters. Don't even know why anyone is still questioning any of it. If I saw videos of Tea Party rallies where the one guy holding a racist sign is being harassed and booed by the rest as being distasteful, then I might believe them when they say the majority don't support that. 2 presidential candidates. One's birth certificate says he was born in the United States. One's birth certificate is from a third world country (Panama). And yet which one is suspected of not being born in the U.S.? What is the major difference between these two candidates that we would make such a fuss over the guy born in the U.S. but not bat an eye at they guy who freely admits he was born in Panama? The difference is that the first candidate is black, with a foreign-sounding name. The second candidate is white and a war hero. Jo Jerome - yeah, good point. Thanks for posting those pics (I think it was you). I needed to see that. The people holding those signs looked like huge idiots. How embarrassing they must be to so many tpers. On the comment about the two candidates for US Pres, one whose birth certificate says born in Panama. The whole point is that one MUST be born in the US to be president. Unless----has the US Gov admitted that Panama is a US colony, like P.R. ?